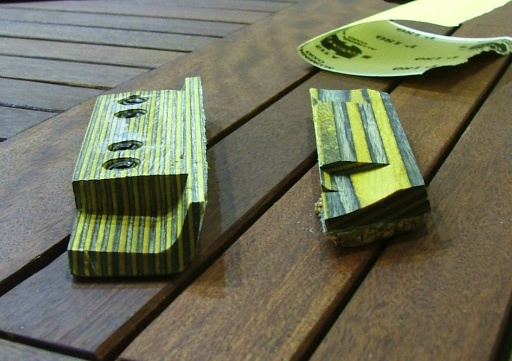 So going through the to-do list from the DURC open, task number one was the cheekpiece. Took it home last night, moved it about a bit, then went to the range with it this evening and tweaked some more. 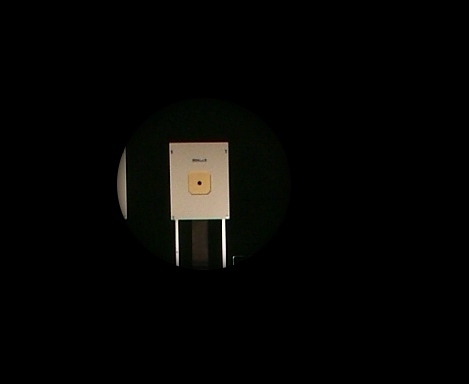 It’s now canted a bit more than the sights are, so that I get a nice upward ‘V’ shape to put my cheek down onto. I suppose you could get an equivalent by putting a ridge on the top of the cheekpiece and keeping it horizontal when in position, but this way lets me get on with it a bit faster. I also moved the trigger back about 5mm or so (I tried further but it was bumping into the pistol grip. I’ll bring in the Dremel at some point in the next few days, dremel out a recess in the pistol grip’s flaring bit to make room, and bring it back a little more). It’s not yet spot-on perfect, but it’s a definite improvement. 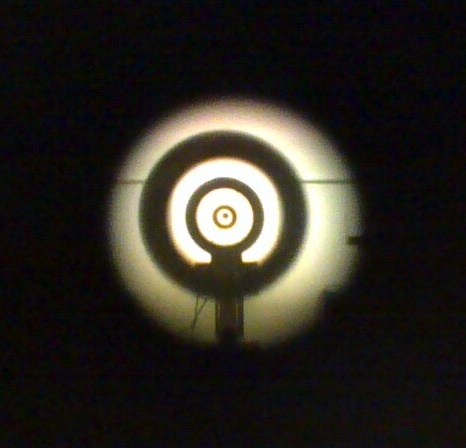 That’s at the second stage of the trigger, about to fire. The trigger hand doesn’t feel like it’s stretching forward anymore, the cheekpiece weld feels good, like bone on wood, the sight picture is a little fuzzy at the bottom because all the flesh is bulging above the cheekpiece and compressing the eyelids from below, but I’m not sure how you’d fix that, or even if you really need to. Not a bad few hour’s work, all told. 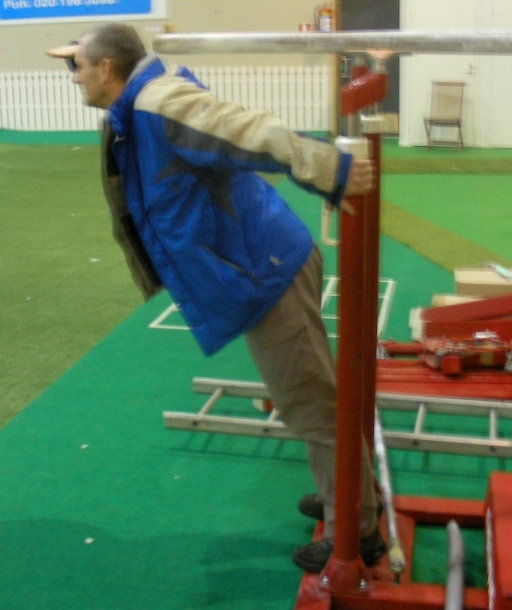 Posted on November 30, 2009 by Mark Dennehy in General, Training. That about sums up the match. Not too much went right today, from start to finish. Woke up a half-hour late, skipped breakfast, got to DURC to pick up my rifle and kit only to run into a snafu over keys and such and as a result landed in the UCD carpark at 1020 for a 1030 detail. Prep time started at 1030 and instead of being sat there at the line in full kit ready to go at the start of prep time, I didn’t even make it into all my kit before we were ten minutes into the match, and there wasn’t enough time to stretch out beforehand so I’m in a bit of pain tonight. Next time, I collect the gear the night before and go straight to UCD if it’s the first detail I think. Sighters didn’t start off too horribly. I adjusted the buttplate slightly as the targets in UCD are a bit lower than they were in Kuortane. That went well, but I was still seeing the odd flier in the sighters and was chasing tens for the last three or four sighter shots. First match shot was around forty minutes in, and so I was running right from the get-go (and I only made it through the sixty shots with around 20 seconds to spare or thereabouts). And right from that get-go, problems showed up. The position didn’t feel quite there; either I was doing the demented ballerina routine with my hip swinging forwards or my lower spine was collapsing downwards (hence the lumbar pain tonight). There’s no support from my jacket anymore at all. Jozef was right, it should have been chucked out ages ago. It’s also now about a size too large for me. Time to buy a new one. The trigger is too far forwards and I’m stretching to get there, so I might be dragging shots out of the ten when triggering. Well, that was on the to-do list from Kuortane anyway I guess. The major problem though, was that the cheekpiece isn’t right. I have no decent cheekpiece weld, just inconsistent contact. I need to bring the cheekpiece more over towards my face and tweak it a bit until I get it consistent again. I’ve already done some work on that, I’ll do more on the range in DURC tomorrow. I wouldn’t mind checking the sights as well. It’s most likely the cheekpiece causing the problem but I feel like I can’t trust it’s adjustments anymore. Even if just for the sake of peace of mind, I’d like to check them. I need to clean the barrel, tube, and just about everything on the rifle. The trip to Finland seems to have dislodged lots and lots of dirt and dust. The new kitbag I got for Kuortane isn’t working. The two-half design sounds like a great idea, but it’s really just a pain in the proverbials. I’ll see if I can’t order a large cricket gear bag online. Time to hit PhysioNeeds.ie and get a pair of the DynAir balance pads and maybe a swiss ball for core stability training at home. I need something other than Powerade for isotonics. It’s just giving me a headache. Half apple juice, half water ought to be good enough, I just need a decent water bottle. Must go buy Air Rifle Shooting online. I need to sort out the buttplate carrier plate the way Jozef pointed out. And I need to make up a better set of blinds (translucent/opaque plastic?). Cutting up paper targets works for a temporary measure, but it’s not quite right. And I need to wear both the headband and the MEC visor, the visor is too tight otherwise. And I need to pull the 4.2mm foresight element I was using – there’s something wrong with the plastic at the top and there was horrible distortion around the edge of the foresight element. If I’d had five minutes during the match, I’d have yanked it there and then and replaced it, but there wasn’t enough time. I might order some Centra High End elements, that distortion was quite distracting and might be worth a few quid to get rid of it. Posted on November 29, 2009 by Mark Dennehy in Events. Fly SAS to Stockholm then Vaasa next time instead of the Helsinki route? Pack as lightly as possible! The mountain hat is a good idea. Cold ears aren’t fun. Panadol. Deep heat. Day two. Say no more. Shaving kit is needed. Grizzly Adams gets looked at funny by airport security. Bring the docking station for the HD camcorder and the component cables to display video on the tv in the room for post-shooting analysis. Need two locks for the peli case, one for each end. Cut hard foam for the peli, soft foam doesn’t cut it – it deforms too much and risks damage to the rifles. Get it cut in two layers if possible and you can fit more stuff in – tool in the bottom layer, then a cloth, then the rifle or whatever above it. 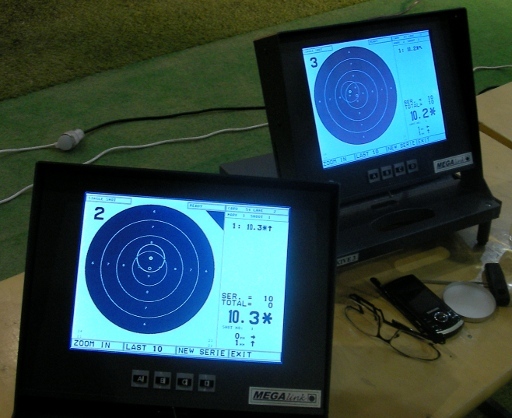 Two weeks would mean nine days of training, not eight, more if you shoot on the weekend too. Always get luggage checked through. Trying to chase a rifle round an airport is a royal pain. Excess baggage charges are huge. €210 out, €225 back. Dressing in layers isn’t just a better idea, it’s more convenient. Long sleeve t-shirt or compression-wear, overshirt or fleece, outer lightweight rain/windproof jacket. No more is needed – it’s -7C but doesn’t actually feel that bad. Neck gaiter would be good too. Maps and tourist guidebooks are dead weight in your luggage. The hotel has free maps and you’ll never use the guidebook. A laptop totebag with a handle is a good idea in the airport. Maybe a hardshell one? Posted on November 22, 2009 by Mark Dennehy in General, Notes and tagged Notes. Back at the hotel, we load the bags into the taxi and do the 4km run to the airport. Into terminal one, up to the KLM desk, all the paperwork is done in seven minutes, I get stiffed for another €230 in excess baggage and have to walk a mile to the desk where I pay it and back again (not joking, a half-mile there, a half-mile back), collect boarding pass and done. 20 minutes. Granted, bloody expensive, but that’s the fastest I’ve ever gone through the checkin procedure with a firearm before. They didn’t even want to open the case to inspect it, so I locked it with the second padlock (the first trip through, it became obvious you needed two), duct-taped the latches down and put it through. Walk on through security and go sit and wait an hour for the flight. On to the baggage collection point and there’s my rifle case waiting for me at the baggage desk. I walk over, let them know it’s mine and that I have another bag coming and I’ll be right with them. I go wait for my kitbag. And wait. And wait. And nothing. Hooray, my kitbag never made it from schiphol. Apparently 90 minutes isn’t enough time to offload it and reload it. Feck’s sake, all the presents were in there, including one for a three-year-old’s party tomorrow. Grrr. I fill out the baggage claim forms and am reassured it’s not lost, they know where it is and it’ll be on the first flight tomorrow and dropped right out to me. (In fact, the first flight landed at 1000h and the baggage got out to me at 1700h, and we were basicly confined to the flat for the whole day waiting on the delivery. Grrrr. €210 out, €230 back, lost for a day and confined to home for a day as well. Not impressed. KLM are so off my winter solstice card list). We take the rifle case through customs, where the customs officer wants to know “is it your training weapon Guard?”. A few words on weapon-v-firearm later, and he explains that looking at my licence he sees the garda crest and we realise he’s not been told there’s a new Irish licence format and he’s not seen this before. Another snafu caused by the Minister’s over-ambitious schedule for the new firearms laws combined with his lack of funding for proper training of the people who run the system. That resolved, I’m waved through, meet up with herself indoors and we head for home. And that was that. A week of hard work (during which I seem to have lost ten to twelve pounds according to the scales), good results, and a list of things to do and to work on and to buy for kit that will see me through a good few months. Now onto the post-training plan, which means doing nothing on Sunday at all, resting through Monday and Tuesday and starting back to the range on Wednesday for balance work and cleaning kit and such, and getting into some regular routine for balance work, and then a match on Sunday with the DURC 10m Rifle Open, which is also the Intershoot selection match. 573 to make the team. 4 points over my PB, so it’s a challange, but that new position feels good. I wonder how it’ll go? Posted on November 22, 2009 by Mark Dennehy in General. The return to dublin was a solo run (Daniel’s staying for an extra week of training, the lucky git). Up at 0750, showered, dressed, final bit of packing (toothbrushes!) and down to the last breakfast with everyone. And then it’s off to the taxi, which arrived three minutes early (a bit of a shock here, where 0930 means 0930, not 0929 or 0931 😀 ). Half an hour of a drive through gloomy drizzle to Senajoki train station (and say what you like about stereotypes being wrong, but how many Irish taxi drivers can be comfortably silent for half an hour and not think it odd?). A brief wait and then onto the train and out of the station at precisely 1038 (see what I mean about times?) and I got to sit down at my PC seat (meaning you get a small table and a power socket for your laptop) and write up my notes from the last few days for the blog. We arrived in Helsinki promptly at 1352 (again with the time! ), and after checking in the luggage into lockers and storage, it was shopping time for a few hours (there’s a birthday party for a friend’s daughter the day after I get back and I was successful in finding her a nice moomin, but not a pink one 🙁 ). And of course some nice Nordic stuff for herself indoors, who sent me on this course as one of the better birthday presents ever 🙂 After the shopping, it was onto the bus (Bus eireann, take note – LCD displays on bus stops showing the three next incoming buses. How hard can it be in Ireland if they can do it in the sub-zero temperatures they get here? And their website has a google maps type of arrangement where you can see the route of the bus so you can see where the best stop is for you). 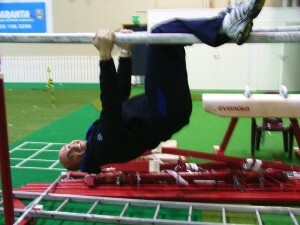 Posted on November 20, 2009 by Mark Dennehy in Kuortane 09, Training. Day four, and feeling better than ever when I woke up. Either the plunge pool and steam room last night did wonders, or I’ve finally acclimatise to Finnish time, just in time to go home 🙁 Downstairs we go for breakfast, and then off to the range. But of course, my head wouldn’t concentrate on the game at hand so I got into a bad routine after shot seven, getting several 9s and 8s before walking away. A faulty megalink cable interrupted things further. 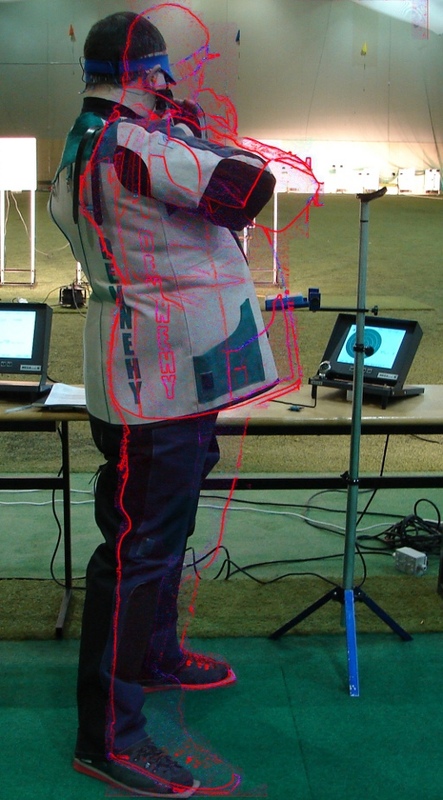 After we finally restarted, Jozef took some video footage of me shooting standing, concentrating on elbow placement. It’s a bit unnerving having someone film you – having them film you while shooting (even dry-firing) from *in front* is even more disconcerting, especially when you didn’t notice precisely where they were. The rifle was nearly dropped a second time at that point! But the footage was good, and we were dry-firing so there wasn’t much chance of causing an international incident by accidentally shooting Slovenia’s most famous sportsman! After the morning’s training, we were all quite weary, to the point where I was too tired to eat much for lunch (which was odd – we’d been wolfing down calories so far because we were burning lots of them off). It was sad to listen to the others planning next week’s training knowing I wouldn’t be able to be there as I was leaving tomorrow. Today was the last day of training for me. I spent most of lunch talking with Kimmo about shooting in Ireland and his recent training camp up near Belfast, with lots of folks I’ve not heard from in far too long, like Alan Lewis and Gary Duff. After lunch, there was more time spent snoozing after a quick email home, and then some administrivia and then back to the range for the last time. Kimmo decided I should continue with more one-shot-routine training, and put me on the noptel to see the difference over the last few days, if there was any. 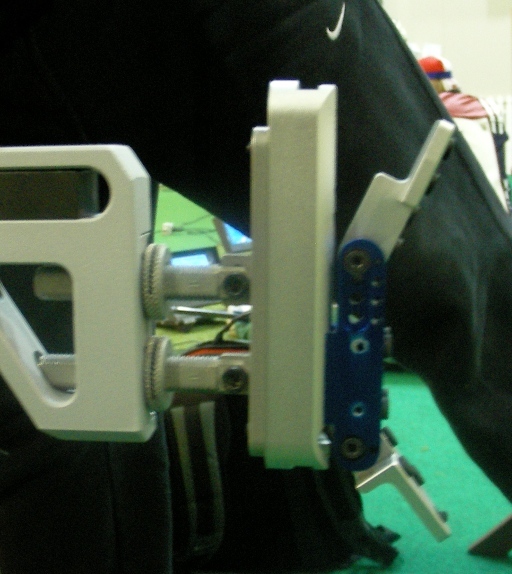 There was – the trigger time is reduced a little, the hold started off better (though the tired muscles left it down a bit). I did have what I thought was technically my best shot of the week, and Kimmo caught it on video – the setup was perfect, the initial hold point was spot on, the rifle came right down neatly onto the target, I held it absolutely solid and took the shot all in 2.4 seconds. The Noptel trace looked excellent and the shot just *felt* right. 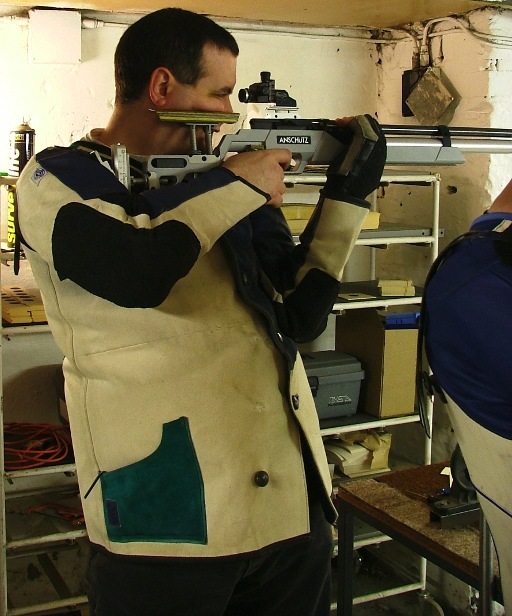 During this, we changed the buttplate again, giving the top of the buttplate a bit more curvature, not to give it a better fit when shooting, but to make sure it didn’t slip as I raised the rifle at the start of my shot routine (more video got taken of this by Kimmo). Around half four though, I could tell I was done. My legs were past the useful “too tired to cheat with muscle strength” point where you can really test technique, and were now in the “couldn’t hold on a barn door” stage. So we called a halt and I started packing my kit while the others ran a 10-shot final in smallbore for practice (and fun for Jozef who was doing all the accents he could remember from World Cups as he called out the instructions). 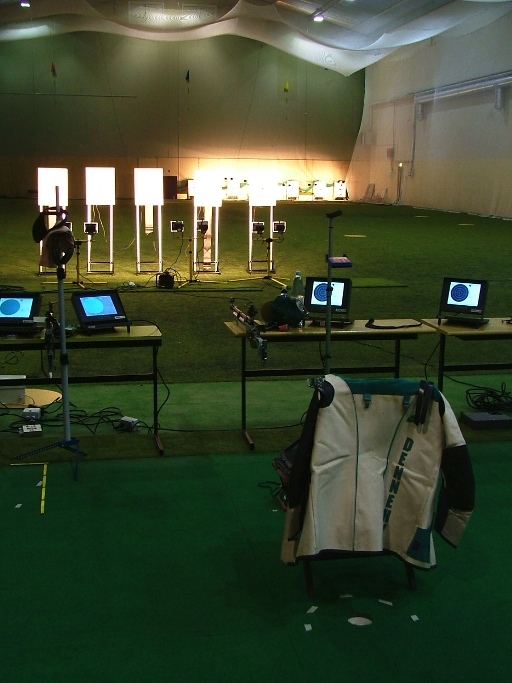 Once the gear was all packed, I brought mine back to the hotel and the others who were shooting air rifle brought theirs to the air rifle range for next week’s training (several more air rifle shooters are landing on Sunday and Monday for next week’s training camp). After that, it was back to the hydrotherapy center and more plunge pool antics, along with a bit of fun at one of the junior’s expense over his reaction to a young lady in a flattering swimming costume, and then back to the hotel for dinner, and after dinner some bowling (the traditional end to any good rifle training camp, obviously). Yet again we showed that Kimmo’s a pretty excellent bowler, that Jozef is seriously funny when he cuts loose to 1980s disco music while bowling, and that I am, hands down, no contest, the worst bowler in Finland. And possibly all of the Nordic countries. And maybe a few more just for good measure. A little pool after the bowling and that was it, we headed back to our rooms and I packed for the trip home, doublechecked train times, taxi times, bus routes and my itenary (taxi from Kuortane -> Senajoki at 0930, train from Senajoki to Helsinki at 1038, into Helsinki just before 1400, luggage to the luggage lockers and I get a few hours to potter about Helsinki and see the sights and buy some presents, then back to the train station, collect the luggage and get the 650 bus back to the hotel, overnight there, then on to the airport on Saturday for Schiphol and on to Dublin, arriving tired at 2130. I hate long multipart trips…). After that, a quick skype call home and off to bed. Day three started better than day two in terms of aches and pains. No panadol needed for ‘muscular aches/pain’ this morning, and no headache from dehydration either – for which we had blue powerade to thank. We were chugging that stuff like there were no side effects 😀 Breakfast was the usual bread, cheese, ham and frankfurters (protein, protein, protein), apple juice and coffee that was the staple for the week. I won’t say Kimmo succeeded. I will say that during the camp he was able to point out actual figures using the Noptel machine that quantified what we all knew – I’m too damn slow on that trigger. Average human reaction time is 0.2 seconds, so you can’t reduce your delay much below that amount; mine is currently at 0.44, over twice that. So I have much work to do here. On the noptel, it was somewhat easier, so maybe I should put in some Rika time back home – but the temptation to play with the damn thing is high, or to ignore the actual impact point and watch the hold statistics. After two hours of this, I was in some pain – the muscles that had been nice and quiet before breakfast were now getting quite shouty. So the break for lunch was very welcome, and after lunch I took a page from everyone else’s books and crashed into bed back in the room for an hour before heading back to the range a bit more refreshed. Back on range it was time for more trigger control exercises. I went through about 80 live shots and I lost count of the dry-firing ones. 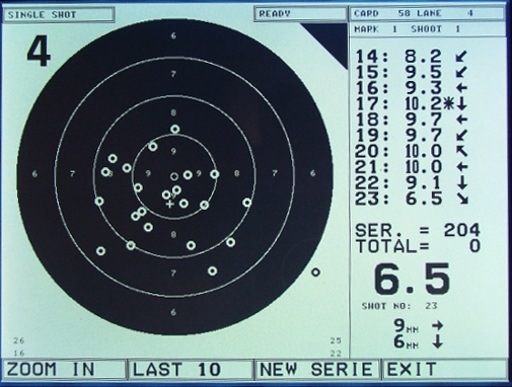 I thought I was getting good results, including one particular 10.6 which was the best shot of the camp to date – deliberate hold, saw the ten, took it positively instead of waiting for it to come to me and the trigger to somehow go off magically. After the training, the inevitable finally happened and we took out a few golf clubs and knocked a few golf balls down the range. This year I was far, far better than I was last year. Last year, I only managed to slice through 90 degrees and hit the wall facing me instead of the one we were aiming at: this time I managed to get the ball to go through 180 degrees and hit the *back* wall. After that, we went back to the hotel’s gym in order to do some work with swiss balls (and yes, we made all those jokes too). I will say this much – for a giant inflatable ball, they make for a great bit of gym kit for core work. I’m quite impressed (and sore). The balance element they bring is good too – I was being pushed hard to maintain my balance while kneeling on it and only Neil Stirton was able to stand on them. Once the gym work was done, it was back off to hydrotherapy. This time around Kimmo decided to show us the Finnish way to do things and demonstrated the plunge pool. Allow me to explain, for those who’ve not done this. The idea is, you go to Finland in late Autumn/early Winter, when the average temperature is between 5C and -30C, you change into swimming trunks and you get into the normal hydrotherapy pool, which is about 5’6″ or so of comfortably warm water, and after a moment or two, you get out, walk up to this smaller pool (about 3′ by 5′ by 4′ deep) that’s filled with ice-cold water, and you get in. And immerse yourself fully. And stay there for up to two or three minutes. After which, you get back in the hot water. And you do this repeatedly. And the really insane part? It feels good. Well, not the first time you get in, that’s a bit of a shock to the system. I think I lasted 30 seconds before legging it to the warm water again. But after that initial shock, it’s a very remarkable feeling. All the capillaries in your skin have shut down and then start to reopen in the warm water, so you get a feeling akin to pins and needles, but different and not as intense and not painful. It’s like a deep tingling all over and it’s quite pleasant, you find yourself grinning like an eejit. It’s disconcerting in that the cold water does stick to you when you get back in the pool so your skin does eventually say “I give up, I don’t know what the hell you’re doing to me” and starts feeding nonsense signals to your brain so you don’t know if you’re in hot or cold water anymore. All in all we were back into the pool three or four times tonight. And after that, the obvious thing to do is spend a few minutes in the jacuzzi and then hit the steam room. By the way, the steam rooms in the gyms back home in Ireland? Pale imitation. The steam in these were so thick you caouldn’t see clearly across the room. And it really heats you up after the plunge pool, and forget dehydration, this thing gets more moisture into you than a danish chicken breast water injector. Your skin feels better, you feel warmer, you feel utterly hydrated, and completely decongested to boot. Wonderful stuff. 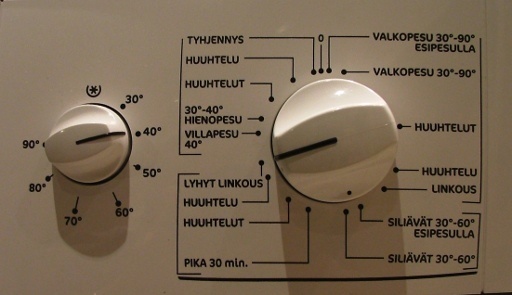 You can see why the Finns make such a big deal about steam rooms and saunas. Dinner after that was a bit of an anticlimax really. Chicken with rice and salad and some nice bread and a yoghurt&pineapple dessert. Nothing terribly fancy. Then back to the rooms, write up the diary and the notes for the blog for the day, skype home, watch a little tv and hit the hay. Well, almost. We did try to do a load of laundry tonight. A better day today by far. Up again at eight, breakfast again (and little in the way of polite restraint here, it was shoveling in the protein and carbs with dedication) and onto the range by nine. 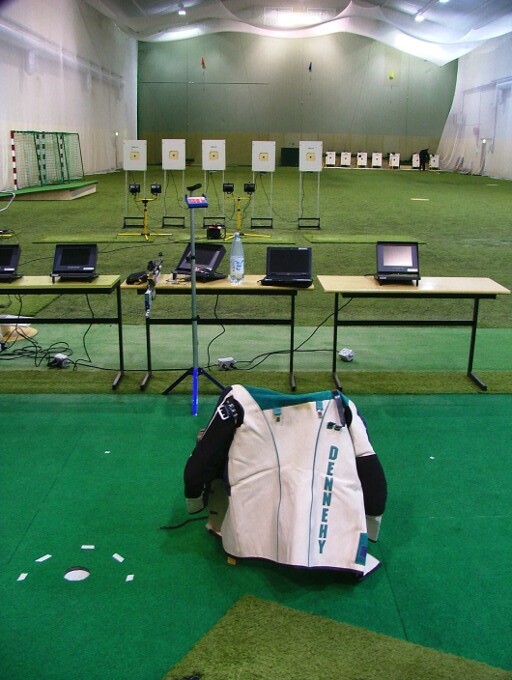 A talk at the range by Jozef Gonci on the one shot routine and then getting the kit together and getting on with it. After yesterday’s fun with my eyesight, I’d bought a baseball cap. Which doesn’t sound rational, but the plan was to use the peak to block out overhead light, and blinders for either side. This worked, sort of. Daniel leant me his MEC visor, one of the neoprene ones that deform when the peak hits the sights, and it worked far far better. That’s one on the must-get list on returning home. With the visor and the blinds, I was able to get enough of a sight picture to start shooting properly. It takes a lot of concentration because it’s not the best sight picture ever, but it’s doable. However, the cheekpiece wasn’t quite perfect – it wouldn’t come over far enough to the left to let me get a decent cheek weld. 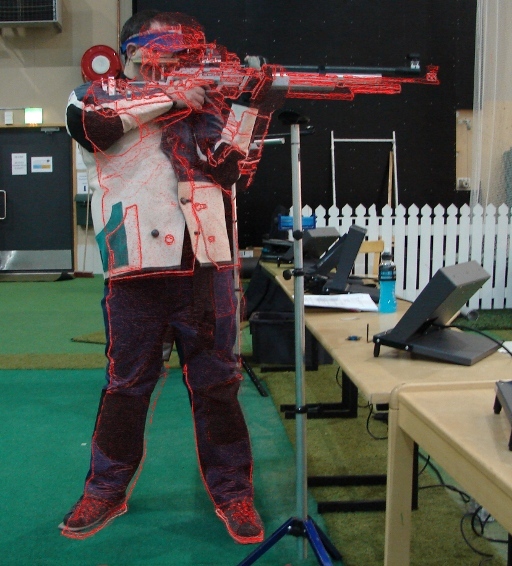 As a result my head was floating in midair behind the sights and that never leads to a decent aim. Trying to move it further left ran up against the side of the cheekpiece I had covered in cork a few years ago for a more comfortable cheek weld (I’d swapped it round a few weeks ago following Matt’s old advice on having a sharper edge to the cheekpiece to get a better weld and stuff being comfortable). So, to get round this problem, I borrowed a saw from Kimmo and cut off the half of the cheekpiece that was getting in the way. 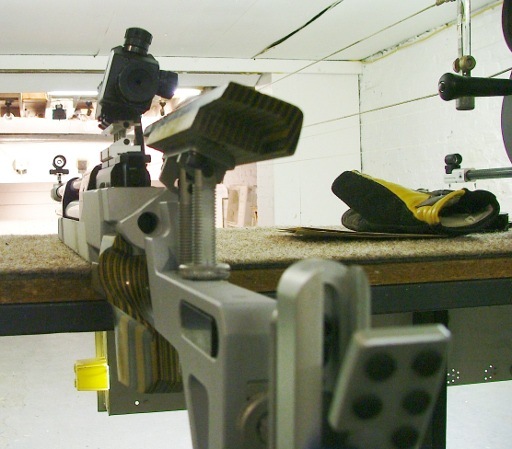 As Matt and Geoff used to repeatedly drill into our heads, if it’s a rifle part and it’s stopping you hitting the target, it’s useless and you should throw it away or cut it up or mangle it without mercy or regret until it does what you paid for it to do in the first place. So sod it. Saw saw saw! And it worked – it’s still not quite 100% perfect, but it’s about 95% of the way there and the rest I can fix when I get home. After this, Jozef came back over and we mucked about with the MEC buttplate a bit more. This is where we discovered that the MEC buttplate was broken, but with a good crank on an allen key we got the heel of the buttplate (which took the brunt of the fall yesterday) to behave itself and we could move on. So now I’m feeling beat up, tired, weary and sore, but happy about my shooting for the first time in the camp so far. I have a sight picture I can shoot with, I have a better position that I can already feel I’m shooting better with even while tired and sore and working on a bad sight picture. So obviously, now’s the time to take us all to the gym and get us pounded with a slightly friendly game of floorball! (At least this year it was just jostling and shouting, noone actually got their nose broken this time 🙂 ). Afterwards, it was off to the hydrotherapy centre again. For those who go to Kuortane (or anyplace that has a hydrotherapy pool), never, ever skip this step, it’s far too good at relaxing very sore muscles. Travel from Helsinki to Kuortane was calm and peaceful by comparison to the flight to Helsinki. A nice fast train ride (~160kmh) north to Seinajoki (the tango capital of Finland apparently) and then a taxi ride west to Kuortane. We arrived around half five or so, two hours after sunset, and dropped the gear to the rooms, had dinner and then fell into bed. The next morning we were a few minutes late to breakfast (still not adjusted to the two hour time difference). Ham, cheese, bread and pickles with water and coffee. Definitely not a greasy fry-up 😀 Then up to the lecture hall for a brief introductory talk by Kimmo Yli-Jaskari, the head coach for the coures (and the head coach for British Shooting as well as a few other things, including an international level Golf coach. Sports is seen as a real career over here instead of being the eternal PE teacher it is back home). The talk was the same as at the last course, with some small extra data thrown in, but basicly went over the three components of shooting (hold, aim, trigger for those wondering) and then how those are statistically analysed and how various shooters show up in the statistics. 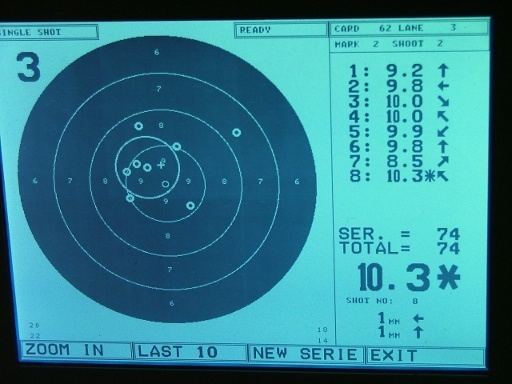 You can pretty much predict an air rifle shooter’s score from their hold statistics as measured by Noptel (or RIKA or SCATT), for example. There was also a section on training plans and a sample one given out by Kimmo that he uses for training. 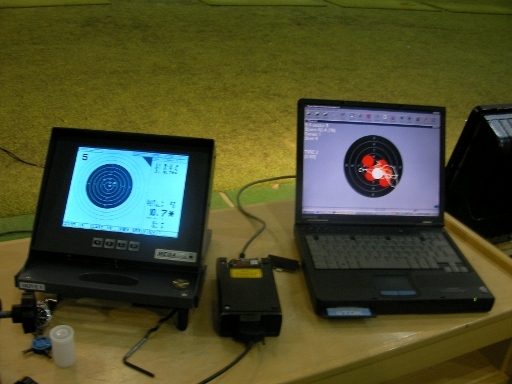 Then it was over to the range. 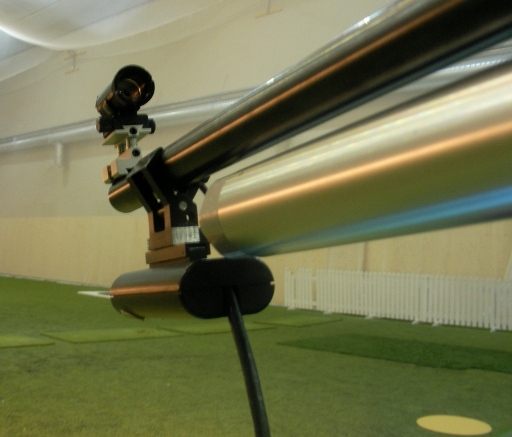 We’re in the golf hall again as you can see, using megalinks at 10m and 50m. Today I was the only person shooting air, all the others were shooting 50m prone. Fun and games over, we got down to shooting and by 1000h, we were well underway and I was dry-firing my way though Kimmo’s MDC (Maintainance-Development-Competition) training programme exercises. 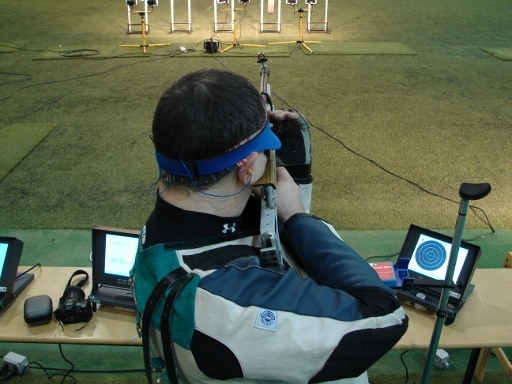 For the amount of rust on me, the hold felt surprisingly good, the position robust, and so long as I didn’t look at the performances of any of the others there, I felt rather good about my shooting. Of course, that didn’t last. All morning was dry-firing, then lunch (rice, steamed beef stew – don’t ask, and yoghurt for dessert), and then back to the range. 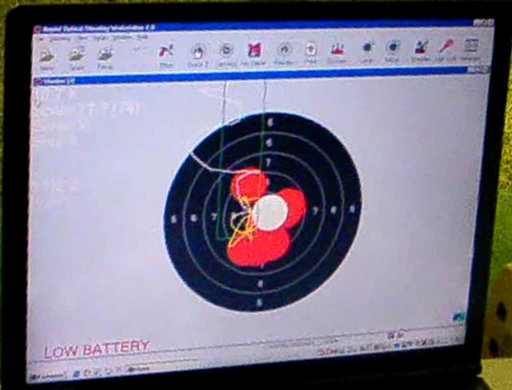 At which point I started to put lead downrange (and two other shooters started shooting air rifle so I’d feel even more discouraged by their constant tens 😀 ). Can you see the edge of the outer black circle clearly? After talking with Kimmo and Jozef about this, we tried a few things (half a dozen colour filters, rear iris wide open through to shut tight, with and without my shooting glasses, and with and without the mirror I normally use on the rear iris), with no decent results. A lot of fustration and shots ranging from 9s to 5s later (and one of those fives hit just before a floodlight failed and I couldn’t help saying “Oh come on, it wasn’t that bad!”, which has lead to a bit of joshing over dinner about how I shot out the lights – which I didn’t! 😀 ), and we weren’t too much closer to a solution. We eventually gave up for the afternoon’s shooting, with notes for myself to get an eye exam for both a general prescription update and a contrast sensitivity test when I got home. 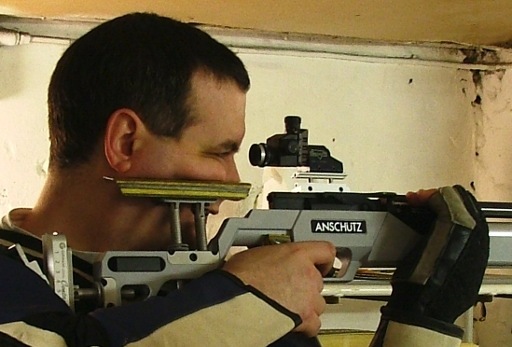 There was some work on the rifle itself though; Jozef pointed out how the Anschutz 2002CA stock has a flaw – the buttplate, viewed from above, is not aligned with the boreline correctly, it’s a centimetre or so off to the right, pushing the rifle into you if you’re a right-handed shooter. This puts pressure on my position, so he wanted to move the MEC buttplate left to compensate; but the MEC buttplate it seems can’t do that (there’s only a horizontal slot for adjustment of position at the top of the buttplate, not the bottom, so it can rotate but not translate — which, by the way MEC, is forbidden under the ISSF rules, 7.4.2.1 (pg.289)!So a new buttplate needs to be bought when I get home. Another reason to buy a new buttplate is that while talking to Jozef about this, the rifle fell off the table while we were both distracted, it landed on the bottom tip of the buttplate and knocked it flat – and I didn’t realise it until later, but that sheared off a locking pin on the buttplate, which means the bottom heel of the plate can’t be properly adjusted anymore. So DURC get an equipment donation and I try to find a buttplate that can be adjusted according to ISSF rule 7.4.2.1 properly. After that was the steam room (and this was a proper Finnish steamroom here, as in three feet of visibility and temperatures well north of body temperature, not the lame versions we have at home), and then the hydrotherapy pool (picture a pool about 5’6″ deep, filled with warm water, and several pipes dumping more hot water into the pool onto its occupant’s heads, backs and feet (underwater pipes too), all at about 3bar of pressure. It’s like being massaged by warm water and for sore feet it’s unrivalled. 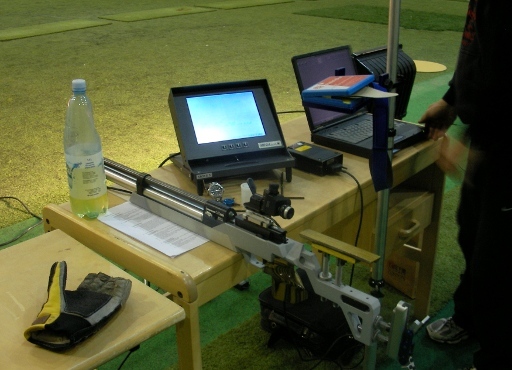 Posted on November 17, 2009 by Mark Dennehy in Kuortane 09, Training. So the day starts early, at around 0330. Alarm goes off after about two or three hours of sleep, and it’s up and shower and say a sad goodbye to herself indoors and off to the car and the airport. Unfortunately I managed to drop my mobile phone along the way, which is a bit of a nuisance when you’re going abroad. The Aer Lingus checkin was painless enough, there was the usual goldfish bowl observation as we get the kit inspected by the checkin desk, then seal the cases up with locks and duct tape, the range kitbags go through normal checkin and the rifle cases and ammunition box go through the odd-sized luggage inspection route, and we go through security and head for some much-needed coffee. The flight to Schiphol was fairly fast, mainly since we slept through most of it (Daniel managing to sleep through crosswind turbulence on takeoff that had even me worried for a moment), and we landed in Schiphol and did the long trek from plane to baggage carousel to find our rifle cases and ammo box going round and round (the range kitbags were checked through, but Aer Lingus and KLM couldn’t agree on how to do that for the rifles so we had to check them through ourselves). And that’s where the first unpleasant shock to the system happened – KLM charged us excess baggage on the rifle cases (which Aer Lingus hadn’t done), pretty much out of the blue. And once we’d gotten over that shock, they then told us it was all a mistake, because they’d accidentally charged us on Aer Lingus’s rate, which was lower, and so they recharged us on KLM’s higher rate. €210 for me, €240 for Daniel (with his smallbore ammo box). We were not happy puppies at this stage. But, that’s all that done and dusted, right? So they check through the cases and ammo again, we go back through security (by the way, if travelling, beltless trousers and slipon shoes are a great idea, if you can afford the extra weight), and we take a few minutes to grab food, email home and do some shopping (AA batteries for cameras and so forth). We agreed to meet up at the gate, so that’s where I headed and sat down with a cup of coffee to watch them load the plane. So it’s out with the licences and the europasses and the passports and there’s some going over the documentation and at that point the guards relax a lot and we relax a lot more and there’s much wishing us luck for London in 2012 and they go back about their normal duties and we sit down for the third unpleasant shock of the day, by this time no longer thinking of keeping KLM on the christmas card list. There’s something about baggage handlers that suggests that one day they’ll earn the majority of the Darwin Awards. Or at least that’s what we were thinking watching one of them test my Peli case to its limits with the luggage loading conveyer belt, and then testing to see how flat he could make Daniel’s range kitbag (the damage was fairly thorough, we discovered later on in Helsinki), but we became sure of it when we watched the senior baggage handler (a man smart enough to wear his tie loose and flapping about while walking around running jet turbine engines) pick up Daniel’s ammo box under a wing full of fuel vapour about seventy yards from a crowded passenger terminal, hold it upside down by his head and then shake it to see if there was any loose ammunition inside that might accidentally go off. Now you and I, having been around ammunition for a while, know it’s not quite that sensitive; but in fairness, had he been right, few of us would have been about to congratulate whatever bits of him remained afterwards. I don’t think being right is quite worth that much. Now thoroughly annoyed and stressed, we got onboard and flew to Helsinki. Not much else went wrong, the landing was a bit rough but so was the weather, and we had no trouble collecting our range kitbags and rifle cases and ammo box from the carousel. We headed into customs to check them through to find there was noone there at all. We looked about for a customs agent, knocked on office doors and still found noone. We did find an intercom for out-of-hours customs though (this was around five pm on a saturday so fair enough), buzzed it and let them know they had two Irishmen with obviously very dangerous firearms, and would they like to check the paperwork? What did we have? well, a dangerous air rifle and an even more dangerous smallbore rifle, coming from the EU. No, no need to see those, go on through. Can I just point that one out again for any officials reading this please? We went to Finland, where they’re mid-debate on changing the firearms laws because of an actual school shooting, and they didn’t give a fig about air rifles or smallbore rifles. So would everyone in Ireland and Amsterdam please calm the bleep down about these things? Can you tell we were stressed by the trip? Anyway, we finally get out into the lovely -6C Finnish air, caught the complementary taxi to the airport hotel, dropped our gear in the rooms, ate dinner, realised we’d just spent 14 hours travelling, and went back to our rooms to crash and sleep for about 12 hours. And that was day one. 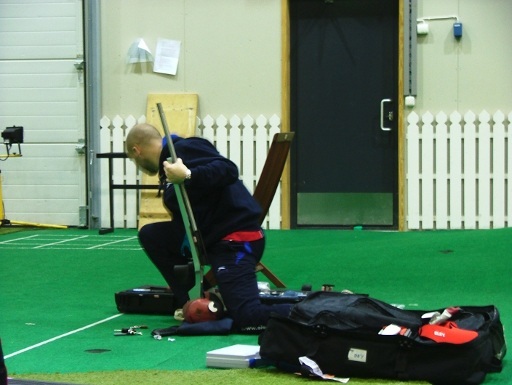 Posted on November 17, 2009 by Mark Dennehy in General, Kuortane 09, Training.